The first Saturday afternoon session brings us a review of new information about the class of drugs known as monoclonal antibodies. Presentations at this session discussed some of the approved therapies such as Darzalex (daratumumab) and how it is being used in various combinations as well as in different patient populations. In another Multiple Myeloma Research Consortium (MMRC) study, Empliciti (elotuzumab) is being tested in the pre-myeloma setting of smoldering myeloma. And the remaining presentations introduce new antibodies not yet FDA-approved. A larger study of 200 patients is now complete using this combination and data will be available in 2019. Another Darzalex combination was studied, this time combining Darzalex with cyclophosphamide (Cytoxan) + Velcade + dexamethasone in 87 newly diagnosed and 14 relapsed myeloma patients. Dr. Habte Yimer from Texas Oncology—a US community oncology center—investigated the safety and effectiveness of this combination (ABSTRACT 152 https://ash.confex.com/ash/2018/webprogram/Paper110310.html). One unique aspect of this trial is that Dr. Yimer and colleagues administered Darzalex over 2 days (splitting the first dose in two) in order to lessen the time of infusion on the first day and ease any infusion reactions. One point of caution is that the benefit of SMM treatment must outweigh its risks. SMM patients may live without symptoms for quite some time, and all treatment regimens have side effects associated with them. New data was also presented on isatuximab, a monoclonal antibody in late-stage clinical trials that binds to the same protein (CD38) as Darazalex. Isatuximab works slightly differently than Darzalex which results in a unique efficacy and safety profile. In the trial, isatuximab was given to 165 patients with relapsed myeloma either alone or in combination with dexamethasone (ABSTRACT 155 https://ash.confex.com/ash/2018/webprogram/Paper111249.html). Both treatment groups responded well to the therapy with responses occurring in 26% of patients receiving isatuximab alone and in 44% of patients receiving isatuximab + dexamethasone. 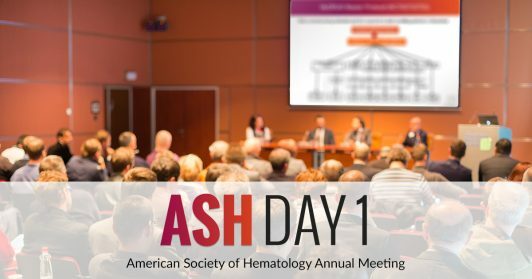 An additional presentation on isatuximab—this time combined with Velcade + Revlimid + dexamethasone in newly diagnosed myeloma patients—will be presented on Monday (ABSTRACT 595 https://ash.confex.com/ash/2018/webprogram/Paper111244.html). There are several phase 3 trials investigating isatuximab combined with a variety of other agents, and should the trials prove successful, isatuximab may be one of the next treatments to receive FDA approval to treat myeloma.